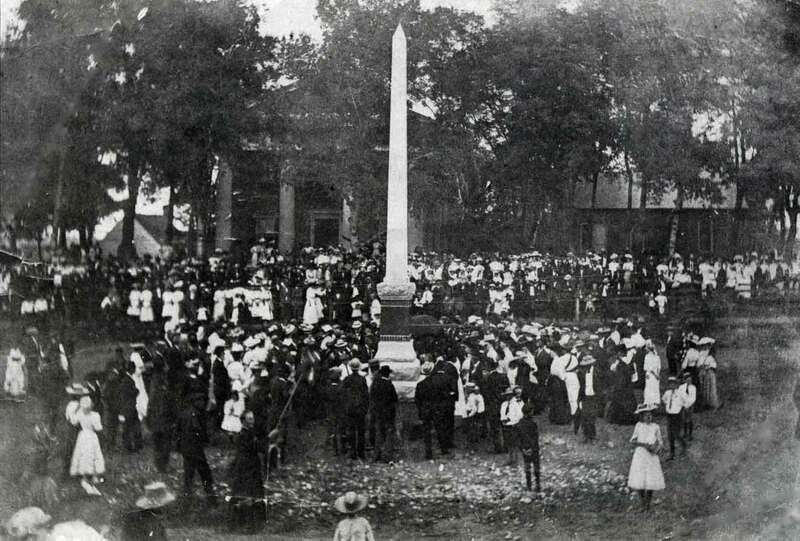 Buckingham County: The Confederate Monument | slate river ramblings . . . .
On June 30, 1908, a double ceremony took place in Buckingham, VA, when the corner stone was dedicated and the shaft unveiled for the beautiful monument, the occasion bringing to that city the largest crowd that had ever assembled there. Veterans, Sons of Veterans, and the women whose part in the war had been so noble had gathered to do honor to the well-loved soldiers. Mr. A. C. Garnett read Lee’s farewell speech at Appomattox, and Judge R. T. W. Duke, of Charlottesville, made a very fine address, as did Col. R. T. Hubbard and Hon. E. W. Hubbard. The corner stone had a vault for receiving relics, and was laid by Masonic ceremonies, after which the handsome shaft was unveiled by Comrade Megginson, who being an invalid, was wheeled in front of the monument in his chair. The selection of this comrade for the honor was in compliment to his well-established reputation as a solder. His cool daring was well exemplified by one incident in his career. He had been sent by Gen. Stonewall Jackson to reconnoiter and came upon twelve men in close conference. Megginson at once shouted, “Here they are, men. Charge!” adding a peremptory call for them to throw down their arms. Thinking at least a company of men must be behind their unseen challenger, the Federals obeyed at once, and Megginson “double-quicked” them to the camp of General Jackson, who in surprise asked if the men were unarmed that they allowed one man to capture twelve! The inscription on the handsome shaft is to commemorate the devotion and heroism of the Confederate soldiers of Buckingham County, who valued principle more than life and fought for a cause they knew to be right. Can anyone comment about the contents of the “relics” in the corner stone vault? There is an article about it at the Historic Buckingham Village. Probably also at the Housewright house. There were pictures and everything, though I don’t have a copy of the document. Kimberly, Perhaps someone will comment with details. Do you know if any other pictures exist of this gathering (or any other gathering) of civil war veterans from Buckingham Co.? Dave, I will be posting other photos and, yes, there are some of veterans, though mostly unidentified. The cornerstone was opening on its centennial. I heard everything was in great shape. I do not know where it went of if anything was put in its place. Thanks Steven. Let’s hope someone has a list of contents!